Breen, David H.. "Ranching History". The Canadian Encyclopedia, 29 May 2015, Historica Canada. https://www.thecanadianencyclopedia.ca/en/article/ranching-history. Accessed 21 April 2019. Photo by Notman & Son (courtesy Library and Archives Canada/C-8812). 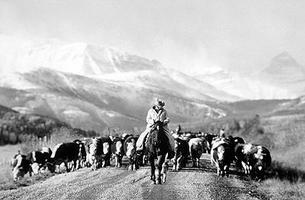 Fall roundup: lead man John Thompson herding cattle back to ranches, Alberta, October 1975 (photo by Ted Grant/courtesy Library and Archives Canada/PA-142584). Ranching developed where physical and climatic features combined to provide sufficient natural grassland for livestock - primarily beef cattle but also sheep - to graze relatively independently year-round. It began in the BC interior in the late 1850s, and was encouraged by markets created by the gold rushes. Livestock was brought in from the western US to the mild, sheltered Cariboo and Chilcotin areas and the Thompson and Nicola river valleys. 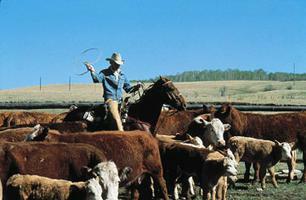 Ranching expanded quickly into other British Columbia valleys, the Rocky Mt foothills and eventually into the Cypress Hills and semiarid plains of southeastern Alberta and southwestern Saskatchewan. Still a centre of the contemporary beef cattle industry, the heartland of the old ranching frontier was the foothill country of southwestern Alberta, where the sheltered, well-watered valleys and the chinook winds which bare the hills of winter snow combine to make it one of the continent's preferred stock-raising areas. After 1874 the North-West Mounted Police provided the 2 essentials of an incipient range-cattle industry: a small local market and security for open grazing. The police were soon joined by Joseph MacFarland, an Irish-American frontiersman, and George Emerson, an ex-Hudson's Bay man, who drove in small herds from Montana. At the same time in the Bow R valley W of Ft Calgary, George and John McDougall established a herd near their mission at Morleyville [Morley, Alta]. Numerous policemen joined the ranching fraternity when their terms of enlistment expired, thus forming a distinctive core about which the industry developed and helping to define its emerging social character. The British-Canadian orientation of the ranching frontier was reinforced by the arrival of Englishmen attracted by the great publicity accorded in Britain to N American cattle ranching. They typically described themselves as "gentlemen" and came generally from the landed classes, with sufficient capital to establish their own ranches. Access to distant markets was assured when the Canadian Pacific Railway reached the prairies in the early 1880s, and interest in ranching grew dramatically. Led by Montréal capitalist and stock breeder Sen Matthew Cochrane, Canadian businessmen vied to obtain the grazing leases provided through the Dominion Lands Policy. 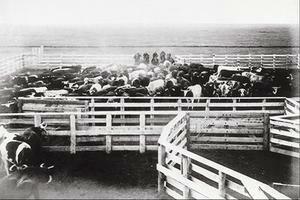 The lure of being able to ship cheaply grown western beef to the rapidly expanding British market and cashing in on the "beef bonanza" led Cochrane and others to organize the great cattle companies that soon dominated the Canadian range: the Cochrane, Bar U, Oxley and Walrond ranches in Alberta, the '76, Hitchcock and Matador ranches in Saskatchewan, and the Douglas Lake, Gang and Empire Valley ranches in BC. The railway, however, also brought the threat of general settlement, especially in Saskatchewan and Alberta, and an accompanying grid of barbed wire fences. Ranchers were determined to keep the "sodbusters" out and settlers were equally bent on penetrating the grazing leases. Finally the government yielded to the overwhelming demand for open settlement: in 1892 the ranchers received 4 years' notice that all old leases restricting homestead entry would be cancelled. 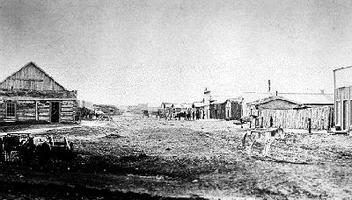 But the powerful cattle compact argued that the ranching regions were too dry for cereal agriculture. Recognizing that the upper hand was with those who controlled the water supply, cattlemen persuaded Ottawa to protect the cattle industry by setting aside major springs, rivers and creek fronts as public stock-watering reserves. Most choice sites thus became inaccessible to settlement, and the ranchers' hegemony continued. After the election of Wilfrid Laurier's Liberals (1896), the cattlemen faced a government committed to unrestricted settlement. Convinced that dryland agricultural techniques were surmounting the obstacle of moisture deficiency, the Liberals began to auction off the elaborate system of stock-watering reservations. The spirited defence of the ranchers' cause by stock growers' associations, and strong beef markets, only slowed the decline of the industry. Soon in full retreat before the rush of homesteaders who settled on even the most marginal lands in southern Alberta and Saskatchewan, the faltering cattle kingdom was dealt the ultimate blow by nature. Whereas homesteaders had enjoyed years of above-average rainfall, the winter of 1906-07 was without the accustomed chinook, bringing stock losses in the thousands for many large-scale ranchers. The passing of the great cattle companies in Alberta and Saskatchewan brought a new generation of local ranchers, including A.E. Cross of the A7 and George Lane of the Bar U, to prominence. At the same time the predominantly American origin of most dryland settlers, and heavy WWI enlistments and casualties sustained by the British-Canadian population, combined to change profoundly the social character of the ranch country. Nonetheless, during the war ranchers' fortunes began to improve: their political party had returned to power in Ottawa, beef prices were buoyant and the return of a dry cycle caused settlement in the region to ebb. A decade later the ebb became a flood and the out-migration of thousands of drought-driven refugees in the 1930s brought grudging recognition that the cattlemen had pioneered, and would carry on, an enterprise especially suited to semiarid environments. David H. Breen, The Canadian Prairie West and the Ranching Frontier 1874-1924 (1983); E. Gould, Ranching (1978); D.C. McGowan, Grassland Settlers (1975).